Light therapy (laser procedures) has been shown in over 40 years of independent research worldwide to deliver powerful therapeutic benefits to living tissues and organisms. Both visible red and infrared light have been shown to affect at least 24 different positive changes at a cellular level. Visible red light penetrates tissue to a depth of about 8-10 mm. It is very beneficial in treating problems close to the surface such as wounds, cuts, scars, trigger and acupuncture points and is particularly effective in treating infections. Infrared light penetrates to a depth of about 30-50 mm which makes it more effective for bones, joints, deep muscle, etc. The diverse tissue and cell types in the body all have their own unique light absorption characteristics; that is, they will only absorb light at specific wavelengths and not at others. For example, skin layers, because of their high blood and water content, absorb red light very readily, while calcium and phosphorus of deeper tissue and bone absorb light of a different wavelength. LED’S and LASERS are no more than convenient devices for producing electromagnetic radiation at specific wavelengths. Several studies establish that it is the light itself at specific wavelengths that is therapeutic in nature and not the machine which produced it. Light Emitting Diodes (LED’S) are another form of light therapy that is a relatively recent development of the laser industry. LEDs are similar to lasers in as much as they have the same healing effects but differ in the way that the light energy is delivered. LED disperses over a greater surface area, this results in a faster treatment time for a given area than laser. In summary, the primary reason that RevitaMed chose the LED’s over lasers is that LED’s are safer, more cost-effective, provide a gentle but effective delivery of light and a greater energy output per unit of surface area in a given time duration. Increase vascular perfusion (circulation) by increasing the formation of new capillaries, which are additional blood vessels that replace damaged ones. New capillaries speed up the healing process by carrying more oxygen as well as more nutrients needed for healing and they can also carry more waste products away. Increase lymphatic system activity. Edema, which is the swelling or natural splinting process of the body, has two basic components. The first is a liquid part which can be evacuated by the blood system and the second is comprised of the proteins which have to be evacuated by the lymphatic system. Research has shown that the lymph vessel diameter and the flow of the lymph system can be doubled with the use of light therapy. The venous diameter and the arterial diameters can also be increased. This means that both parts of edema (liquid and protein) can be evacuated at a much faster rate to relieve swelling. Induce a thermal like effect in the tissue. 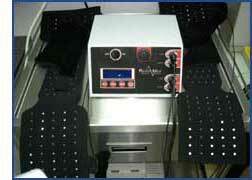 The light raises the temperature of the cells although there is no heat produced from the diodes themselves.